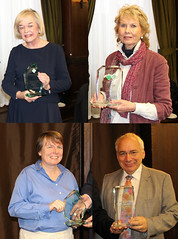 The EBU presented awards in recognition of various members' contributions to bridge in England at the AGM in London yesterday. Congratulations to all recipients, and we thank them for their contribution. The Young Player and Young Pair of the Year awards had been previously presented. These recognise outstanding performance for England's Junior teams and were made to Kripa Panchagnula and Toby Nonnenmacher & Kyle Lam.